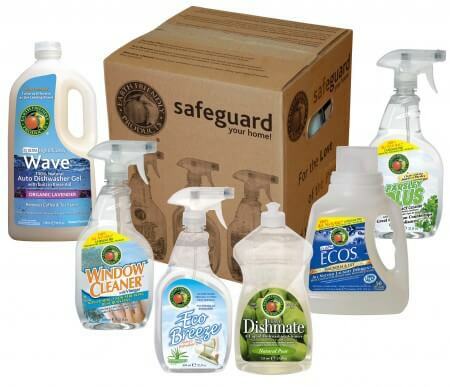 Four (4) Safeguard Your Home Cleaning Kits! FIRST To eliminate 1,4 Dioxane, a carcinogen, from all products. FIRST To stop use of salts in all cleaners, an action necessary to protect water supplies. FIRST To eliminate Formaldehyde, a pernicious toxin. FIRST / ONLY To introduce a patented neutral pH automatic dishwashing product, WAVE® Gel. TOP SELLING Green Laundry product worldwide, ECOS® laundry detergent. ONLY Green manufacturer with plants strategically located in 5 regions. FIRST To generate more than 50% of our plant electrical needs by using solar panels. ONLY Green primary manufacturing company. For every action below that you complete, you receive a specific number of entries. Click each individual action to enter yourself. For actions you have done in the past (i.e. you already follow Earth Friendly @EFPClean or @RonandLisa on Twitter) just click directly on ‘I did this’. The eligibility of the winner will be verified by The Healthy Home Dream Team™. There is no mandatory entry. Each action will earn different numbers of entries into the contest. You may tweet or share on your Facebook wall for an entry once per day. All other actions will only be counted once. You must be 18 or older with a US address to win (sorry international readers). Contest ends 12/7/11 at 12:01am PST. Click here for complete terms and conditions. I love the sound of the ECOS laundry detergent. Most laundry detergent’s kill me with the smell associated with them. This has no smell which is awesome! My favorite is the Ecos Liquid Laundry Detergent in Lemongrass scent. I LOVE your washmaschine detergent! you guys are the best!!!! My favorite is the fruit & veggie wash! Yes, we love this too :) Good luck everyone. Last day!!! Never heard of this brand – thanks for sharing! Thanks for the giveaway…we like the Ultra Dishmate in Natural Pear because there are always mountains of dishes to wash at our place. My favorite product is the window cleaner plus vinegar. Thanks! I love the Orange Plus cleaner! ‘Just wanted to say thanks! I have received the products and the ones I have tried so far are awesome. Would recommend to anyone a really good value.